Six-month check-up at the pediatrician yesterday! The paper on the exam table was a huge hit! He probably pulled half a roll before we were done. I should have asked them for a to-go roll! Unfortunately, his visit ended with a couple shots which wiped that precious smile off of his face. Baby boy is a big guy, 89th percentile for height and 54th percentile for weight. He has a big head too - 95th percentile! I'll assume that is because he needs room for all of his genius in there. If you were given $1,000 to spend in one day, what would you buy? Once you have answered the question for yourself, think about your answers. How many of you first thought to buy something for someone else? For your kids, perhaps? Maybe something for the husband or friends? Or maybe you thought of a fun way for the family to enjoy something together. I really wonder how many of you thought of at least one someone who isn't you. I know, it seems crazy early for most people around the country, but we go back at the beginning of August here in the South. Our last day of the school year was May 22nd, so we've had our fun and now we must prepare to return. Amelia will be a first grader. She will move up the hallway in the school and she returns with excitement and confidence. She knows where the various rooms are within the school and she knows the routine. She will walk in like she owns the place. Amelia is anxiously awaiting meet and greet day so she can find out which teacher will be hers and which friends will be in her class once again. Kindergarten was an amazing experience for us both. I cannot help but smile when I think about it - she grew up faster and learned more than I ever could have imagined. 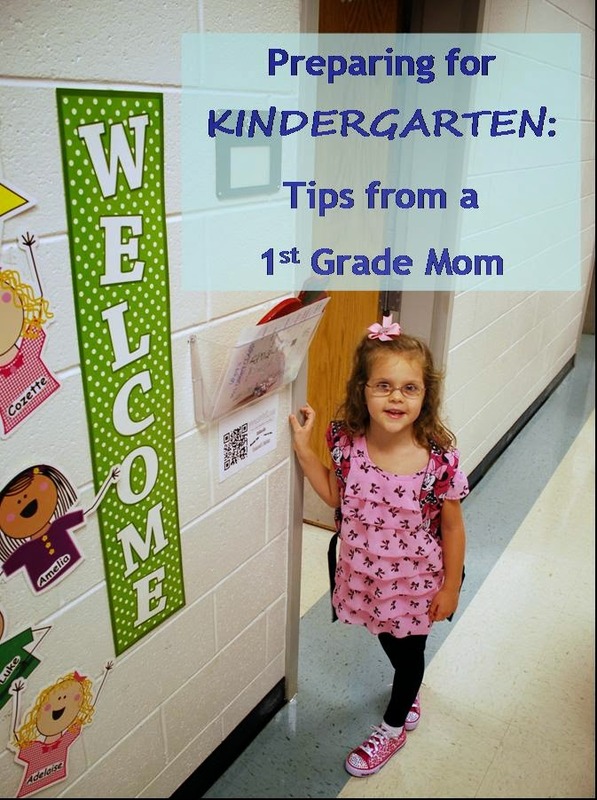 For those of you who may be facing the start of kindergarten, don't fret. I know it may be very difficult to leave your child at his/her first "big kid school", but just wait. The year will astound you. These kids learn so much more in kindergarten than we did, perhaps even in first grade! (1) Establish a routine early. School can be a shock after a summer of lax schedules, later bedtimes, vacations, and fun events. Kindergarten is serious business. It begins on time (for us, much earlier than preschool) and the students get right to work immediately. The kindergarten day is busy; the students bounce from activity to activity rapidly throughout the day. It is good that way because at their ages, attention span only lasts so long. Establishing a morning routine will help to keep everyone in the family sane. Children thrive best on schedules. And when they have some serious schoolwork and learning ahead of them, it helps to begin their day the same way as much as possible. They know what to expect. Eventually, that routine becomes habit. I participated in an Ambassador Activation on behalf of Mom Central Consulting for Banana Boat® Sun Care. I received product samples to facilitate my review and a promotional item to thank me for participating. Many metro Atlantans dislike the term HOTlanta. I actually think it's rather fitting. In the summer months, we go about our daily lives on a lot of pavement and concrete with temperatures usually in the 90s and humidity measuring at least 50%. We do not have sea breezes or frequent cooling rain. When it does rain? It doesn't seem to cool; we just receive more humidity when most of us were already melting. It's hot and it's Atlanta... so why not? HOTlanta is as good a term as any. For most of June, July, and August, we tend to stay indoors. If the humidity gives us a bit of a break, we often venture out for some playground or neighborhood fun once the sun dips behind the houses and/or trees. 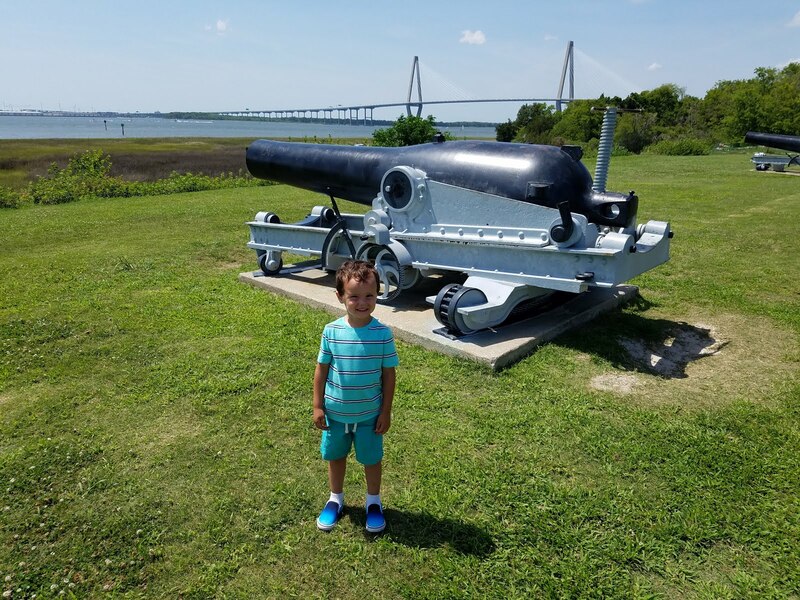 But year-round, when we are outside (often at the water park or pool), I ensure that my family is protected from the bright southern sunshine. I keep my family protected with sunscreen, like one of the many varieties of Banana Boat, as often as I can. I had to train myself to remember sunscreen. And frankly, I did not focus on it as much on it before kids. But with Amelia's young skin and now Andrew's, I try to ensure their "safety coating" as much as possible. We often do not know the sun damage we face until decades later, so protection now is very important to me. An oldie but a goodie (posted 2 years ago) Now I have two kids, a job, a consulting gig, and more! Still waiting for my giant golden trophy. --- I work outside the home a few hours per week and squeeze in the rest whenever I can, usually from the couch downstairs. So yes, I have a "job"; I am a working mama. I also have this mothering job. The job that takes precedence in my life no matter what. The job that is physically and mentally demanding. The job that allows for no personal privacy whatsoever, but has the uncanny ability to create a most dreadful sense of isolation at the very same time. The job where my "boss" lives with me, eats with me, and goes on vacation with me. The job where I have absolutely no option to walk away or search the listings on Monster.com. I know I am in this career for the long haul. I received complimentary tickets to the show for my family. However, as always, all opinions are 100% mine. The Little Mermaid via Broadway in Atlanta is a colorful and delightful experience for all ages -- and limited seats are still available for THIS weekend (July 10-13)! Get Little Mermaid Atlanta tickets here. My husband and I took Amelia out on a special big kid date last night. We dressed up, left baby boy with a sitter, and made the 25-minute drive to the city for a traveling Broadway show! Amelia always enjoys going into the heart of the city. We point out the big buildings and show her where Daddy attended Georgia Tech for a couple years and where Mommy used to work on the 30th floor of the fancy Four Seasons hotel building. We parked in a lot next to the Fabulous Fox Theatre, a gorgeous step back in time that is listed on the National Historic Register. Amelia loved the brilliant lights on the Fox sign, the detailed ceilings and "castle-like" appearance, inside and out. 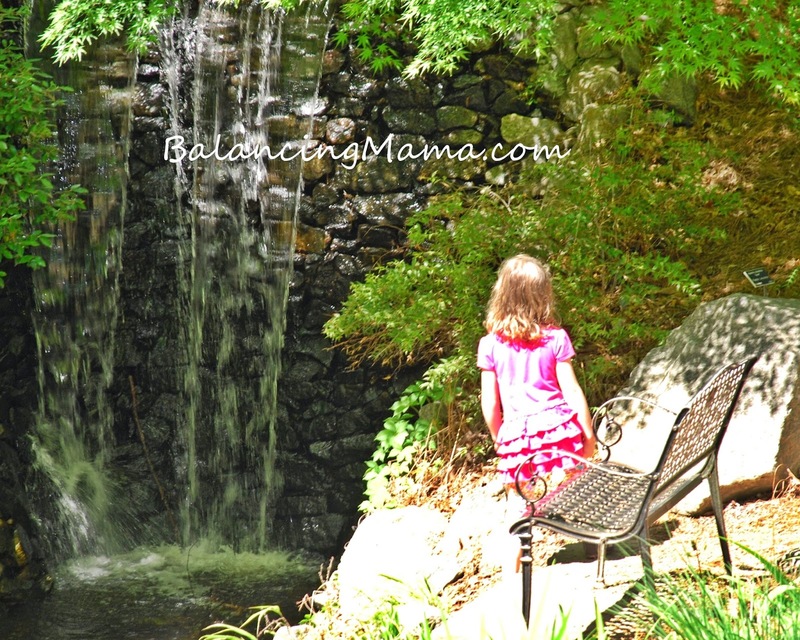 Summertime as an Atlanta parenting blogger is a lot of fun. I mean, I have to take the kiddo(s) to a bunch of fun attractions so I can tell everyone all about the new exhibits, attractions, ride, etc. It is my duty, of course! Shortly after school ended for the year, we had an amazing day at Hurricane Harbor, the new waterpark inside Six Flags Over Georgia. We also visited the World of Coca-Cola. And we played on a Friday evening at the LEGOLAND Discovery Center. LEGOLAND is a blast with four 4D movies, two rides, lots of Legos (of course! ), a playground area, and the new Ninjago laser maze. I did not take a ton of photos at LEGOLAND that evening, but I did manage to have Steve snap a few of me with my favorite girly playmate. Perfect for a Mommy and Me Monday! And, by the way? This girl has some speed! 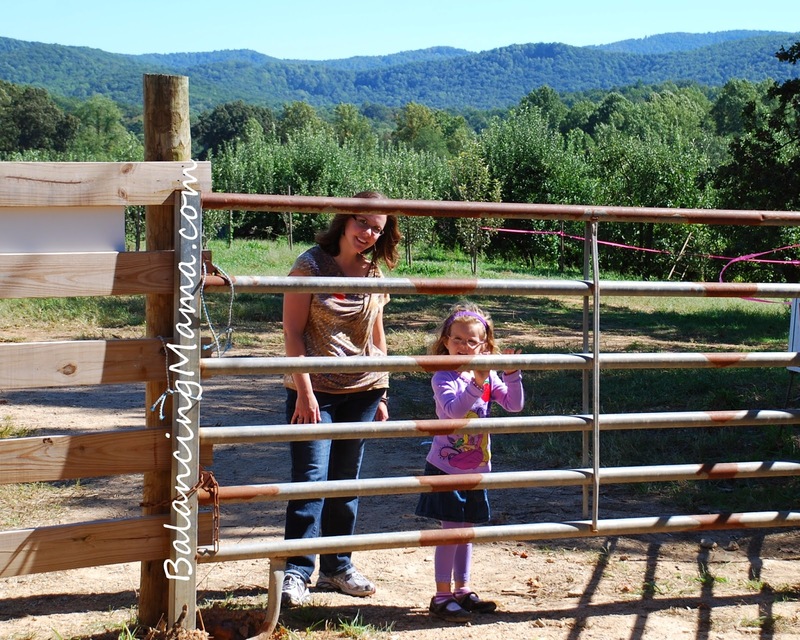 Link up your photos with Mommy and Me Monday on Really, Are You Serious - every Monday! Amelia isn't going to find out for a while, but she will be joining us at Beaches Turks and Caicos in the fall for an amazing #BeachesMoms long weekend! Her passport is expired; the photo on it was taken when she was nine months old for our extended family trip to Europe. I guess it's a good thing that children's passports only last five years - how silly would it be to have a baby photo for a now walking, talking, reading little girl? Last weekend, we took the kids to Walgreens for passport photos. We want to renew both kids on the same year moving forward, so we got Andrew a passport pic as well (this calls cruising in our future, I think!). Amelia was not very interested in this process. She was tired from a busy summer day, hungry, and totally disheveled. She wanted to go home to play. Her hair was a bit crazy, she had a black pen mark on her face a' la fake Cindy Crawford (I failed at removing it), and she flat out refused to smile. So now the child has a new passport photo. For the next five years, this is the one she will live with. And if the cops ever need a good mug shot of my kid? Well, here you go. On the bright side? This is going to make me laugh for the next five years. My daughter, a precocious age six (which seems more like sixteen), has a special gift. She is compassionate beyond her years. Her kindergarten teacher remarked to me that she hasn't often seen a child of that age with such a tender heart for others. Six-year olds are naturally live-for-the-moment beings; they just want to have fun and please themselves. Amelia's gentle soul is a blessing to me, as my heart fills with joy when I see her share her love. But her tender heart also causes excess worry. She worries more than many kids her age. I have to push her to try new things, talk her through new (i.e., scary for her) social moments, and hold her up when she is angry with herself for occasionally being "bad". Last week, Amelia participated in British Soccer Camp (via Challenger Sports, here in the Atlanta suburbs). 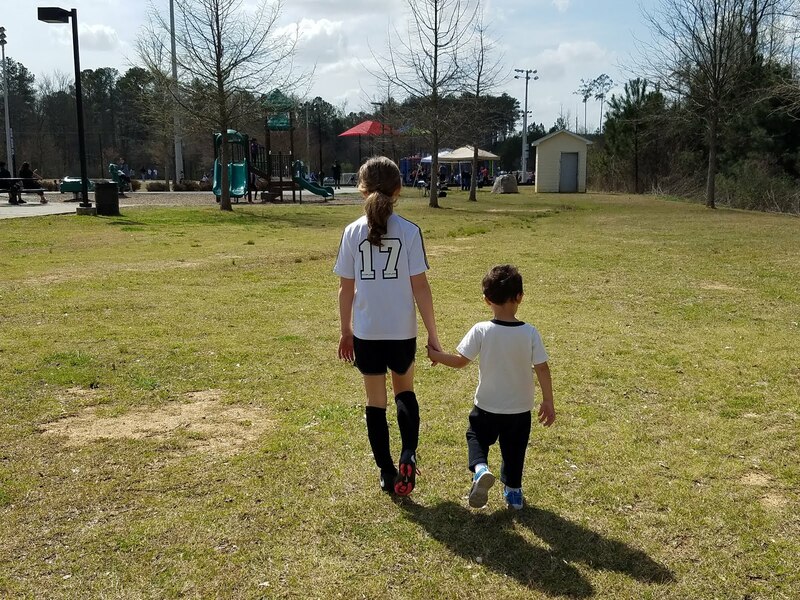 She has enjoyed rec soccer for two years, and she has done well accepting the new coaches and teammates as each season ends and begins again. But Mom and/or Dad are always there. British Soccer Camp was more serious. The coaches traveled from England and Wales to work on technique and hone the kids' soccer (futbol) savvy. I dropped her off at 9 am and picked her up at 1 pm every day, Monday through Friday. She barely slept the Sunday night prior. She was worried about not being good enough. She feared not making any friends. She was extremely nervous that I planned to drop her off.